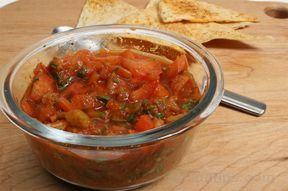 Homemade salsa is the perfect way to enjoy your garden harvest throughout the year. Use tomatoes, green peppers, and jalapeno peppers fresh from your garden to make this fantastic canned salsa to enjoy the entire year. Make fresh salsa to enjoy during the harvest season. Remove the skins and chop the tomatoes. Chop the onions, green peppers, and jalapenos into small pieces. 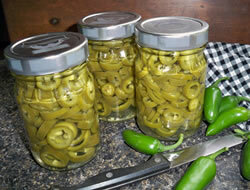 Be sure to remove the seeds from the jalapenos before chopping. Place these vegetables and all the rest of the ingredients into a large pot. Cook over medium high heat until the salsa mixture comes to a full rolling boil. While the salsa is cooking, prepare canning lids and rings by placing in a saucepan, covering with water, and bring water to a simmer. Once lids have come to a simmer, turn heat off but leave saucepan with lids on the burner and allow lids to remain in the hot water until ready to use. After the salsa comes to a full boil carefully pour the hot salsa into canning jars. 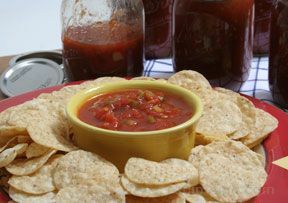 Wipe any salsa off the rim of the jar that might have spilled when filling the jars; seal with canning lids and rings. Set the jars aside and allow the salsa to cool completely. The jars should seal while they are cooling. 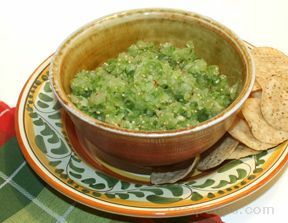 "I have used this recipe and I wait to add the cilantro just before serving so that the salsa keeps the cilantro flavor, otherwise, if I put it in when I am canning it, the cilantro looses most of its flavor." "Who ever heard of a salsa without cilantro?"